New York Fashion Week may have technically ended, but the impact of those seven days will stick with me for a while. Between the shows and presentations, the street style, and the overall sentiment around the city that week, the takeaway (for me at least) was that while Europe is cool and all, don’t sleep on the brands of NYC. From Khaite’s stunning runway debut and Area’s epic show that nearly monopolized Instagram for the night to the Wardrobe.NYC event that even scored a now-rare and coveted Gigi Hadid appearance to the street style stars wearing those lesser-known brands such as Priscavera and Ratio et Motus equally as much as the big-name logos we all recognize, it felt like a new era in fashion that put New York brands ahead of many of the greats of years past. So much so that I was inspired to round up some of my favorites that might not be on your radar quite yet but seriously should be. So to read about and shop the eight New York brands that the fashion world is all about right now, just keep scrolling. “Pretty sure New York fashion is reborn, and it’s thanks to [Khaite],” Leandra Medine captioned an Instagram post she shared shortly after the brand’s runway debut about a week and a half ago. As someone who was also there to witness it, I couldn’t agree more. Beyond clothing, though, the brand has only added to its buzz with the announcement of its first accessory collection, composed of covetable handbags of all sizes. Remember Old Céline? Yeah, Peter Do worked there. Whether or not you have that knowledge, however, it’s clear from simply looking at his clothing that the man is a master of tailoring and taking everyday basics to new levels. From a backless knit to artfully placed cutouts on a button-down, Peter Do pieces can elevate any wardrobe—making it clear why Net-a-Porter chose him for their Vanguard program this season. Founded by designer Josh Goot and Christine Centenera, who, among many other things, is a stylist and the current fashion director of Vogue Australia, Wardrobe.NYC aims to provide luxury shoppers with just what its name implies, a wardrobe, albeit an all-black one. Taking the “drop” approach of putting out pieces in numbered releases, each collection can be purchased in clusters. Its latest streetwear release offers four or eight pieces that, ideally, can be worn together on repeat. 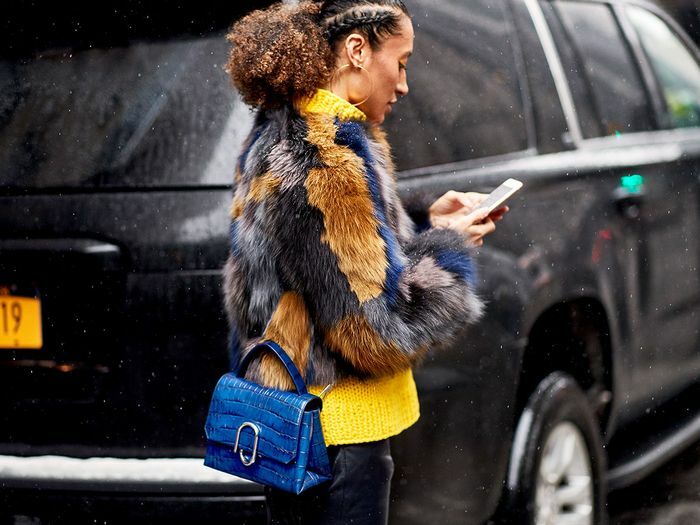 The handbag brand may have launched (exclusively) on Net-a-Porter like five minutes ago, but that didn’t stop it from being one of the most-carried brands of NYFW street style. With sleek structured shapes trending hard for spring, Ratio et Motus is undoubtedly only going to continue to gain steam into the season. Since it’s one of my personal favorite brands of the last few seasons, it’s hard to control my bias when it comes to Area. However, I think that within seconds of seeing its recent F/W 19 collection, anyone who’s unfamiliar would feel the same. The statement-making separates and accessories always stand out and feel ahead of the curve while maintaining that ever-important wearability that makes you want to actually buy something. “Is that Priscavera?” is a question I found myself repeating over and over to my co-attendees during the course of New York Fashion Week, and of course, since I never forget a fashion item, I maintained a high success rate, and the answer was always yes. The brand’s aesthetic, much like the goal of street style stars, is relaxed but always impeccable and, of course, undeniably cool. Unsurprisingly, its F/W 19 collection followed suit, with every outfit shown paired with Nike Vapormax sneakers and more awe-inducing looks than I could count. While researching this story, I was actually taken aback to read that Sies Marjan was only established in 2016, seeing as it has the fashion street cred of a brand that’s been around for decades. The brand’s use of colors is unparalleled, and there’s rarely a trend guide produced without at least one mention of its pieces. This is not your average ’80s-inspired collection. With a much more subdued, workwear-inspired nod to one of fashion’s funnest decades than we usually see, the design trio behind Commission (another Vanguard brand) is putting out subtle-yet-statement-making versions of the everyday essentials we all wear and thought we didn’t need more of. Time to think again. Up next? How to take Instagram-worthy pictures of your shoes—a visual guide.